Difficulty in expressing thoughts verbally. How much do your services cost? In creating the Children’s Dyslexia Centers, Inc., it has been our mission to provide professional tutoring free of charge to children with dyslexia/learning disabilities. Services are made available to children on a first-come, first-served basis. We are also committed to increasing public awareness of dyslexia as well as improving the standards of care through research and education. And, we provide free training to qualified individuals to become Orton-Gillingham tutors. Since 1994, thousands of children have received free specialized instruction a the Children’s Dyslexia Centers, one of which is located in Belleville, Illinois. How do you help children succeed? We work with 1st through 12th grade students who are experiencing learning difficulties in the areas of reading, spelling, written language and related areas. We provide a service for students with learning disabilities at no cost. Our professional staff members are certified in specialized techniques and work one-on-one with students. Instruction is individualized to meet each student’s needs, and every student receives two 50-minute sessions per week. How do you teach children with dyslexia? Our centers use the Orton-Gillingham method of reading instruction developed by Dr. Samual T. Orton and educator Anna Gillingham. The Orton-Gillingham method teaches phonics using visual, auditory and kinesthetic modalities. 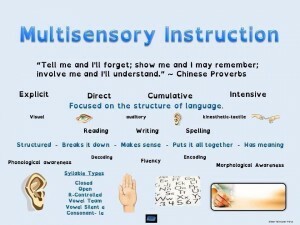 The multi-sensory instruction begins by focusing on the individual sounds represented by letters and explicitly teaches the blending of sounds into words. The core of the method is teaching the saying with the writing of the sounds used in spoken English. The cumulative and sequential Orton-Gillingham program continues to build in complexity but always provides students with immediate feedback, repetition and integration of reading, writing and spelling. The instruction is intensive, one-on-one, emotionally sound, language based and success oriented. Is my child dyslexic? What might the symptoms be? When a child struggles with reading, writing, spelling, and sometimes even speaking, it is possible that the problem is due to dyslexia. The common signs listed below do not necessarily mean that a child displaying them has this learning disability. However, if a child continues to display difficulty over time in the areas listed below, testing for dyslexia should be considered. Who do I talk to first? How do we get a diagnosis? Talk to your child’s school first. A formal evaluation by trained professionals must be conducted to diagnose dyslexia. Sometimes a child’s school is able to conduct the necessary testing, and sometimes testing needs to be done by outside specialists (at a hospital or through a clinical psychologist). Organizations such as the International Dyslexia Association (IDA) can help locate a specialist in your area. For additional resources contact us or the Children’s Dyslexia Centers, Inc. Informal screenings or progress monitoring. If my child is dyslexic, how do I to enroll him or her in the Children’s Learning Center program? Formal testing must be conducted before contacting the Children’s Learning Center. Once this evaluation is completed, the parent should locate the nearest Learning Center, then call the Center Director, who will request that you complete an Admission Application and send copies of the results of the Cognitive Abilities and Achievement Assessments listed above.